Biscuits with high fiber content. Ingredients or additives derived from genetically modified organisms (GMOs) are not used in the preparation. Store in a dry and cold place, protected from sunlight. 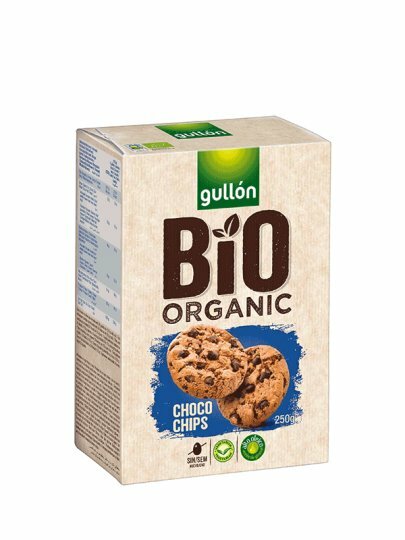 wheat flour *, chocolate chips 25% * (cocoa mass, sugar cane sugar, emulsifier (soy lecithin)), vegetable oil (sunflower high oleic oil) 16% *, raw sugars * sugar, glucose and fructose corn syrup * , dough picking agents: sodium and ammonium bicarbonates, vanilla flavor. It can contain traces of milk, nuts and gluten. Does not contain eggs.